I'm just getting used to my new MacBook Pro with Retina display, but ran into a few issues. Then, log out or make a copy of the app so that OSX will notice the change. Now, the info window will not show "Open in Low Resolution" as checked. Launch Eclipse and enjoy your new retina awesomeness. It worked like a charm for me. Note that if you've run Eclipse, OS X has possibly cached the Contents/Info.plist file and you may not see the changes. You can work around this by simply copying Eclipse.app, deleting the old Eclipse.app, and replacing it with the copied Eclipse.app. The next issue, and the point of this post, was the Android emulator. Update! Today (14 Nov 2012) I noticed there was an update for the Android SDK. This update fixes the issues with the Android emulator. 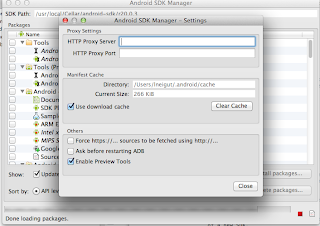 You no longer need to do this step if you update your Android SDK and ADT plugin. I'll leave this step here though for the heck of it. As some people mention, ADT 21 fixes this. Until it's properly released, though, you have to use the "Preview" version. Installation is pretty easy. Separate from these things, if you're noticing Chrome isn't displaying PDFs in high DPI either, go to chrome://flags and enable Enable high DPI Chrome PDF Viewer until they release a proper fix for it. Note it's an experimental feature, but I haven't had issues (yet).